Types of Fishing that the Bad Boyz fishing crew offer you. These Sharks are a shallow water shark species. 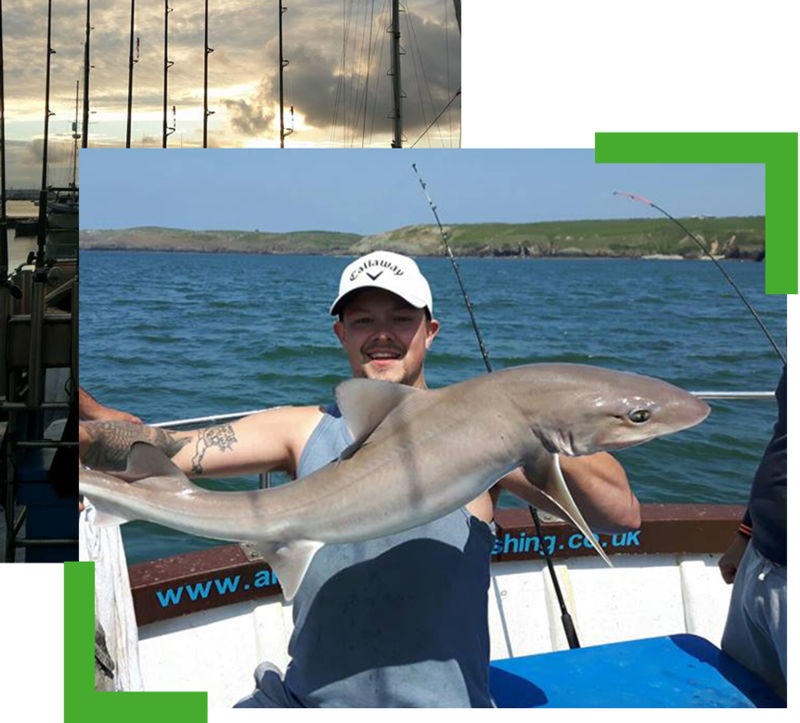 Smoothhound fishing has come to be of somewhat famous around the Anglesey coastline with the quality of fish coming from both boat and shore marks throughout the Summer months starting mid-May. Every year multiple 20lb+ fish come to the boat showing the quality we have in our area. These hard fighting sharks are found in shallow water normally 60ft and below on slightly rough terrain where they will be hunting out food which consists of crabs, prawns and crustaceans. Smoothhound unlike most sharks don't have teeth. In there mouth you will find a tough 40 grade sandpaper like pad connected to extremely strong jaw muscles enabling them to brake through the toughest of crab shells. 12lb class boat rod, 5000 sized reel and 20lb braid will be more than enough for anyone starting out on the sport of smoothhound but you will see many anglers on board Bad Boyz trying to tempt these fish with the lightest if not most stupid rod they can find all in the search of the adrenaline rush. A simple 4ft 50lb flurocarbon hook length and a big mouth 3/0 set up as a running ledger will do the trick, baits being peeler crabs when available.